Amazing Photos, Pro Camera and Lighting, Online Gallery Digital Downloads, Custom Art and More! Choose our Open style or Enclosed photo booth for your event or wedding!. Either way our photo booths can fit from 1 person up to 12 people in one shot! Your guests can go through the booth as many times they want. The booth prints out (2) 2 by 6 inch photo strips each photo session in just seconds! We add your logo, name and date of your event on to a photo strip and design a custom background for each photo strip. Our Ultimate Party packages and all Wedding packages include unlimited prints. This means everyone in the photo booth with get their own copy of the photo strip! Your photos are uploaded to an online gallery and accessible for one year. You and your guests can view, download or share on social media. We use a DSLR Professional Camera capable of taking 18mb photo strips! Our clients are surprised how our booth can print out lab quality photo strips in just seconds! We are constantly switching out the props to make your event more memorable! Over 100+ crazy props for you to take awesome crazy shots in our photo booth! 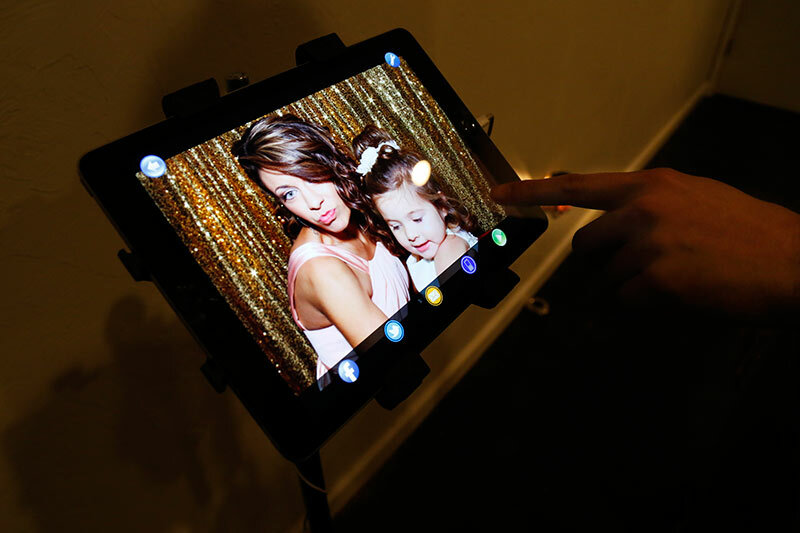 Our touch screen monitor in the Photo Booth will display artwork on a custom welcome screen that matches your theme, colors and feel of your event and wedding! Just one more cool way we make your event fun and memorable! You choose on our touch screen monitor whether you want color, sepia (old look) or black and white photo strips. 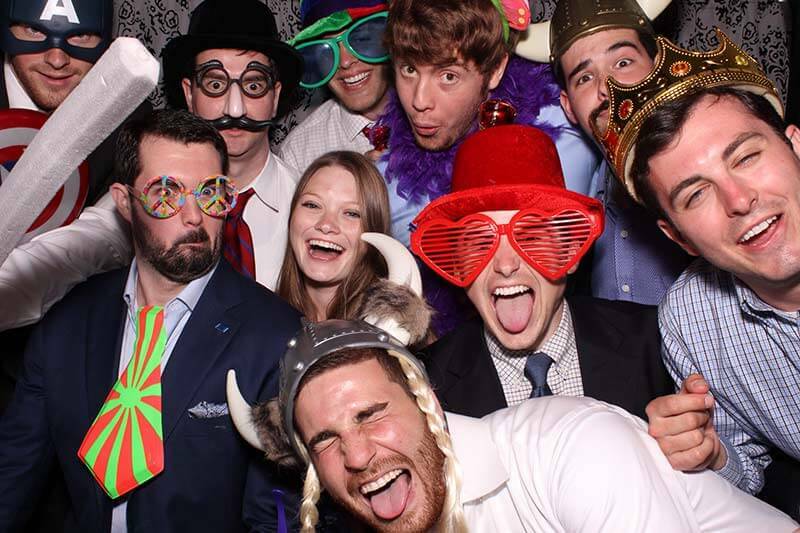 Our Photo Booth rentals include 2 guaranteed on-site attendants at every event. Whether it’s getting you “Propped” up or working the scrapbook station or laughing with the guests, our goal is to make sure you have a 5 star experience! We never charge for your photo booth setup and tear down. Part of the job! Your choice of multiple backdrop options for your photo booth event! Color choices such as black, red, white or silver and gold sequins are available. 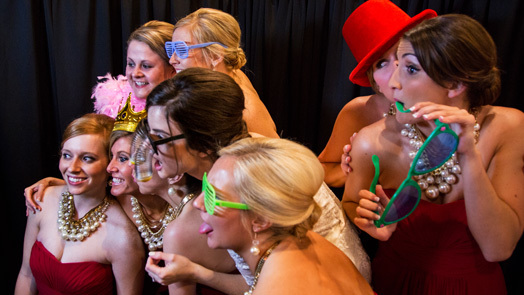 Upgrade your photo booth package at any time with our booth enhancer add-ons! Add an extra hour, unlimited prints, instant social media upload, themed props and more! All Photo Booth images are placed in a memory book for you to enjoy for years to come! Our scrapbook attendant will encourage your guests to sign your book beside every photo strip. A wonderful and priceless keepsake of your special day! Our on staff Photoshop Artist will match the colors, theme and feel of your wedding that will be printed on every photo strip. This custom artwork makes your strip unique and a special memorable keepsake for your guests to take home with them. Your guests can upload their booth photos to their phones or email from a social media kiosk. This is a fun, and great way to broadcast your event or wedding as it is “LIVE” and plaster it all over social media. The Ultimate Photo Booth Enhancers for Wedding and Party Rentals! A great way to create even more fun and excitement for you and your guests during the event! With our ScrapBook feature, we place one photo strip from each photo booth session into an album. Guests can then leave their own personal message next to their photo. It is a great way to capture memories for years to come. Your guests can upload their booth photos from a social media kiosk using email or text message. This is a fun, and great way to broadcast your event or wedding as it is “LIVE” all over social media. Allows your guests to say messages to you on camera while sitting in our booth. These video messages are compiled and placed on a DVD as a digital file for you, family, and friends to enjoy or share online!